Peckish night owls now have a new option to tantalize their taste buds right in the heart of Victoria’s bustling Chinatown. 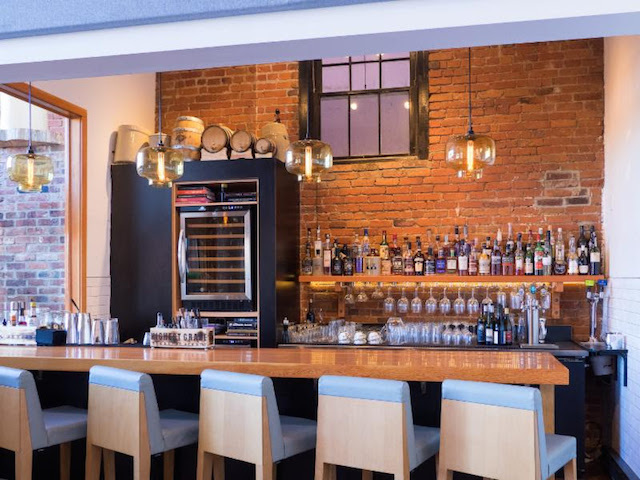 OLO (formerly Ulla), a farm-to-table establishment with a focus on local, sustainably raised ingredients, is now serving up its fresh fare and savoury snacks after hours. Ideal for a post-shift hangout or an intimate, laid-back get-together, the new menu panders to late-night noshers prowling for an after-hours drink and nibble. The late-night menu is bar focused and features unique offerings such as Dram and a Can (Canadian whiskey paired with local beer), as well as a bevy of modern cocktails. The Young Bacchus combines Ampersand gin with sparkling wine, basil and bay leaf syrup and peach sorbet; and the Morris Miner Float is a hearty mixture of Collingwood whiskey, Suze liqueur, pear maple shrub, lemon juice and cherry cola foam. The bar program, lead by head barman Shawn Soole, also highlights the region’s offerings with an impressive list featuring B.C. distilleries, breweries and wineries, as well as rare Canadian and American whiskies. Perfectly mixed cocktails showcase local producers and ingredients and boast a variety of whimsical infusions from foraged botanicals, house-made vinegars (carrot, grape and honey) using local produce and healthful tonics with island spring water. The late dining crowd can also nosh on a variety of small sharing plates. OLO has introduced a bevy of savoury “midnight” snacks to sate those late-night cravings, including their dry-aged cheeseburger with fries, a trio of fried oyster cabbage tacos and charcoal grilled flat bread topped with lamb bacon, ricotta and minted peas. Executive chef and owner Brad Holmes knows relationships are forged over food. With an emphasis on ethical food systems and locally sourced ingredients, Holmes incorporates small-batch produce and cruelty-free, sustainably raised livestock into his menus. Whole animals and fish naturally raised and sustainably caught from nearby waters are used when and wherever possible. When each ingredient is curated with care and can be traced back to its source, every meal pays homage to the island community and the bounty it offers. OLO also integrates numerous foraged products from around the island into its dishes, as well as the tastiest ingredients harvested in season and preserved for use year round. OLO offers dinner daily from 5pm, and serves up its late-night snacks until midnight Sundays through Thursdays, and through 1 a.m. on Fridays and Saturdays. For more information, visit www.olorestaurant.com.